The Ice Cream Man is Getting a Ticket??? Whose next for crying out loud! 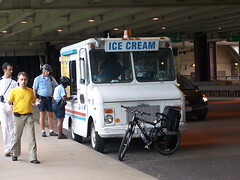 On our trip to Navy Pier yesterday, we saw the ice cream man pulled over by the police (on bikes) and receiving a traffic ticket. About the saddest thing I’ve ever seen. This entry was posted in Photography and tagged humor, pathetic, Photos by Ron Bieber. Bookmark the permalink.